No sauce, no spice, no flavours. 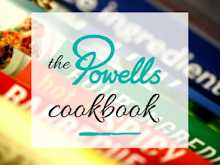 Good, fresh food cooked simply can be just as delicious as the most complex dishes. 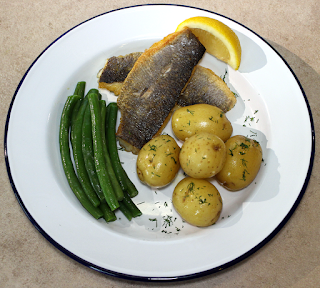 Simply pan fried in rapeseed oil the fresh sea bass fillets are perfectly joined with fresh, boiled new potatoes topped with a bit of dill, and french beans blanched then finished off in a pan with a bit of butter. The whole thing takes about 10 minutes and is a delightful summertime dinner. 1. Bring a pan of salted water to boil then add the new potatoes and simmer for about ten minutes or until soft. Stab them with a fork and if they slide off they are ready. Drain then add a blob of butter, salt and pepper and spin around the pan to evenly coat. 2. Blanch the beans in boiling water for about three minutes then drain. Allow to dry then finish off in a frying pan with a blob of butter and somne salt and pepper. 3. Season the sea bass fillets then fry skin side down in a drop of rapeseed oil in a frying pan on mid-high heat for 2-3 minutes, flip over for a minute then serve with the beans and the spuds topped with dill and a wedge of lemon. Simple and delicious.